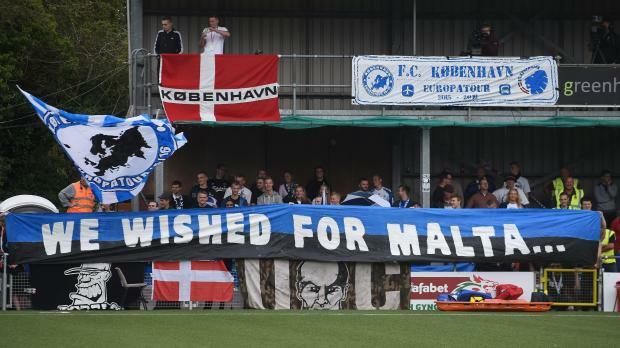 FC Copenhagen fans with a banner in the stands during the UEFA Europa League Second Round Qualifying match at Latham Park, Newtown. Copenhagen won 3-1. Birkirkara produced a stunning performance to push West Ham all the way in their Europa League second round second leg clash at Ta'Qali tonight, but their hopes of pulling off a famous upset were dashed in a penalty shoot-out. The Stripes took an early lead when a goal by Fabrizio Miccoli after 15 minutes brought the two sides level on aggregate, West Ham having won the first leg match 1-0 last week. West Ham were low-key for most of the game but their experience saw them them through in the shoot-out as they converted all their penalties as defender Nikola Vukanac's miss from the spot proved costly for Birkirkara. Nevertheless, Birkirkara left the stadium accompanied by deafening applause after an extraordinary display that did their supporters and all Maltese football fans proud. Over 15,000 spectators gathered at the National Stadium for the eagerly-awaited game. The Birkirkara fans created a fantastic atmosphere and their players responded well as Giovanni Tedesco's stormed into the West Ham from the outset. Italian striker Fabrizio Miccoli, flanking Liliu in attack, had a shot stopped by Joseph O'Brien after a flowing Birkirkara counter-attack had caught West Ham at sixes and sevens. Minutes later, Miccoli's menacing cross, from a free-kick, dropped in the box, prompting Matthew Jarevis to clear the ball away for a corner. West Ham went close in their first foray into Birkirkara's half. 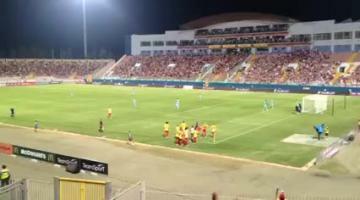 Mark Noble's corner from the right was partially cleared, the ball fell invitingly to Jarvis whose strike was stopped by Justin Haber, the Birkirkara goalkeeper. Birkirkara stunned the Hammers when taking the lead on 15 minutes. Their transition from defence to attack was brilliant as the two Muscats, Zach and Rowen Muscat, traded passes before releasing Paul Fenech who hit a through-ball to Liliu who sped through. The Brazilian sprinted into the box before aiming a low cross into the box and Miccoli, who else, slid in to push the ball past Adrian. With the tie now level on aggregate, the onus was on the Hammers to step up their game. They rallied, briefly, but Birkirkara remained the more confident side. The fired-up Miccoli was booked after a bout of pushing and shoving with Noble who had fouled the Italian striker in midfield. West Ham's toils to get to grips with Birkirkara's ebullient approach was causing concern for manager Bilic. Then, on the stroke of half-time, Birkirkara received another boost. As Aaron Cresswell was preparing to take a free-kick down the inside-right channel, Tomkins appeared to drag down Nikola Vukanac as the two grappled inside the box. The Serbian defender needed medical attention and, when the tension abated, Albanian referee Enea Jorgji booked Vukanac before brandishing the red card to dismiss the West Ham defender to loud cheers from the baying crowd. On the stroke of half-time, Marcelina had a grounder blocked by Adrian after good work by Liliu on the right. 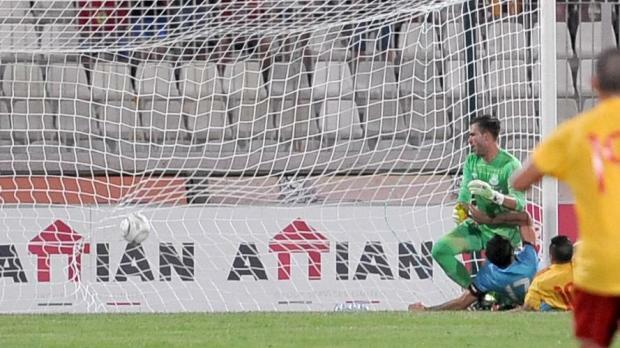 The second half was five minutes old when Adrian fisted away Miccoli's teasing cross-shot, from a left-wing corner. The Italian was first to the clearance but his weak grounder rolled past the near post. Midway into the second half, Miccoli made good progress on the left after being released by Camenzuli who was on hand to receive the return pass but his outswinger was off target. The Birkirkara goalkeeper was prominent again when parring away Jarvis's angled effort after the latter had been sent clear by Noble. A hobbling Rowen Muscat, a stand-out performer for the Stripes, made way for Edmond Agius 20 minutes from time. With 13 minutes remaining, Vito Plut came on for the exhausted Miccoli. 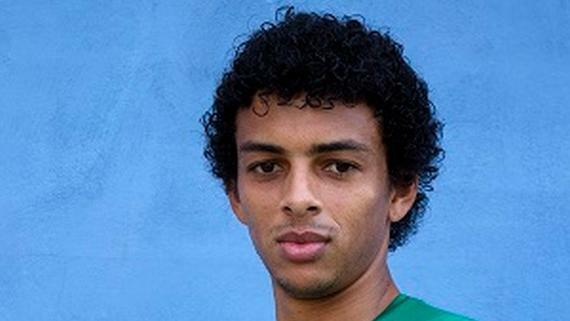 As the game entered the final 10 minutes, Liliu rifled wide from the distance. Fenech also tried his luck but his long-range belter was blocked by Adrian. On the cusp of time, the outstanding Liliu sprinted clear on the left but his cross was headed away by Collins. From a short corner, Jarvis's low cross was diverted away for another corner. Birkirkara were quick to surge on the counter with substitute Plut running the length of the pitch, pressurising the back-tracking West Ham players but his scrambled effort sailed into Adrian's hands after taking a deflection. 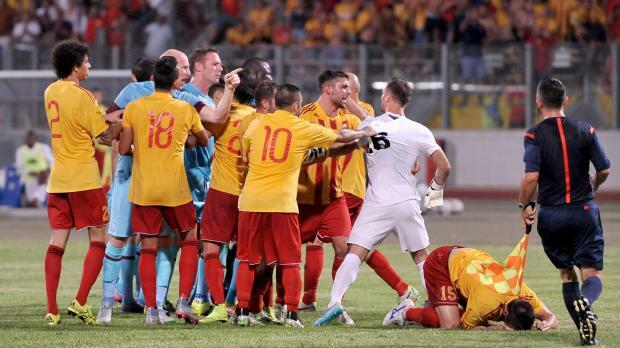 Mauricio Mazzetti, the Birkirkara defender, was expelled early three minutes into the second half of extra-time after earning a second booking for clipping an opponent's leg. Marcelina, stormed through the centre before serving Agius but the latter's curler was too weak to unsettle Adrian. The West Ham goalkeeper stopped a dangerous Birkirkara attack when coming out to push the ball away from the sprinting Plut who had been sent clear by Fenech. Four minutes from the end, Maiga had the ball in the net but the Mali forward had strayed offside. With no breakthrough after 120 minutes it was all down to penalties. West Ham's Noble, Zarate, Cresswell, O'Brien and Samuelsen all scored from the spot. Paul Fenech and Vito Plut scored for Birkirkara but Vukanac shot high. Edmond Agius also scored, but Birkirkara were out, even if not down. J. Haber, E. Marcelina (97 K. Zammit), M. Mazzetti, P. Fenech, R. Camenzuli, F. Miccoli (77 V. Plut), N. Vukanac, Liliu, J. Zerafa, Z. Muscat (70 E. Agius), R. Muscat. Adrian, A. Cresswell, K. Nolan (59 D. Poyet), J. Tomkins, M. Jarvis (120 M. Samuelsen), C. Kouyate, M. Zarate, M. Noble, J. O'Brien, J. Collins, M. Amalfitano (50 M. Maiga).